Do you remember this car?! Well... yes, it IS the 1990 model! And I still have it! Back in the day, I used to race the thing, usually with some success! I always liked this car, because it was very simple to maintain, and it usually never ever needed anything! That simple! In fact I have raced this car in the European Championships held in Naestved, Denmark in August 1991! I finished next to last, but the point is that I have raced in the same qualifying heat with Craig Drescher and Juha Steenari! It was an epic time for me, at least! 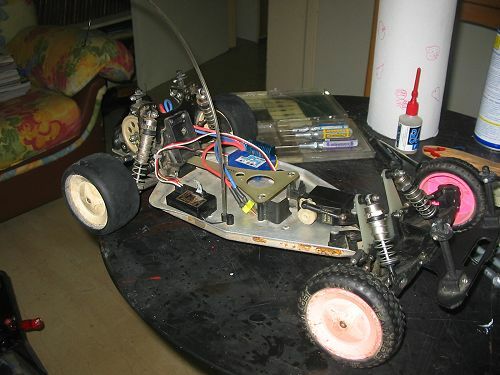 Its front suspension is nothing fancy, but amazingly still works nicely! The shocks do not leak, and the damping is acceptable. 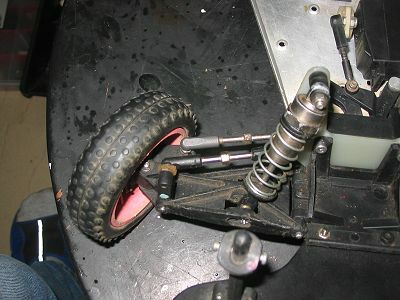 The front tires used to be spiked buggy ones, but driving on asphalt has taken its toll! 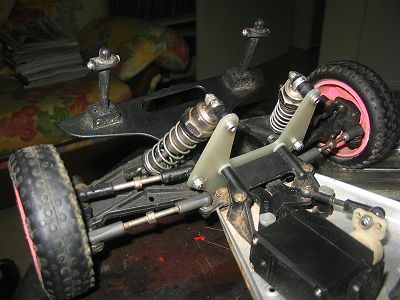 The rear suspension is one of the same: Simple and effective! I have replaced the rear fiberglass shock tower with a graphite one, because at some time the fiberglass broke, probably after a very bad spill! I never really claimed to be a good driver, however!!!!! 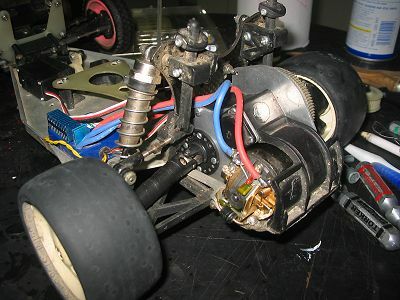 The differential takes its energy from a belt that still works very well, even though it's 15 years old! The motor is a "Something" 15X2 (I know it says so on the rotor!) and with a longish 89/22 gearing gives plenty of acceleration and very good runtime as well! The electronics are simple as well: A Futaba 2PL guides its own receiver, an S3003 servo and an LRP 14T ESC. Finally the body is a Frewer BMW 320i of the 90's BTCC era, while other bodies have also covered the Cougar in its life: A Parma 57-Bel-Air, which also won the first ever "rallycross" race in Greece, a Ford Cosworth, also from Parma, I believe, and lately a Ford Mondeo which originally was given with Schumacher's cheapo Wildcat touring models. 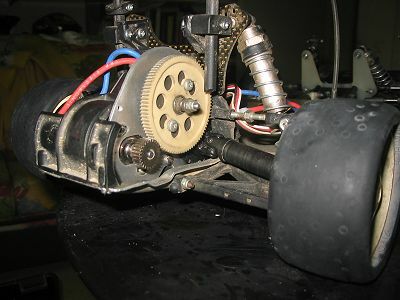 The tires from that Wildcat will be put to service on the Cougar really soon, because the rear buggy tires, as you can see are almost done... or are they already?!!!! Who cares!